FLAMES completely engulf an apartment building on Northborough in North Houston. NORTH HOUSTON – The Houston Fire Department responded to two 2- 11 fires overnight in the Greenspoint and North Houston areas. The first was a vacant 2 story office building at 4045 North Freeway near Crosstimbers. The initial dispatch time was 10:47 pm last Sunday evening, March 11. One civilian was transported to the hospital due to an asthma attack on-scene aggravated by smoke inhalation. The civilian was a bystander evacuated from the Texan Inn hotel across the street, due to extremely heavy smoke surrounding the building. Part of the building collapsed and was deemed a total loss. The cause was not determined at this time. The second fire was a 2 story apartment building in the 13500 block of Northborough. The initial dispatch was at 3:43 am Monday morning, March 12. 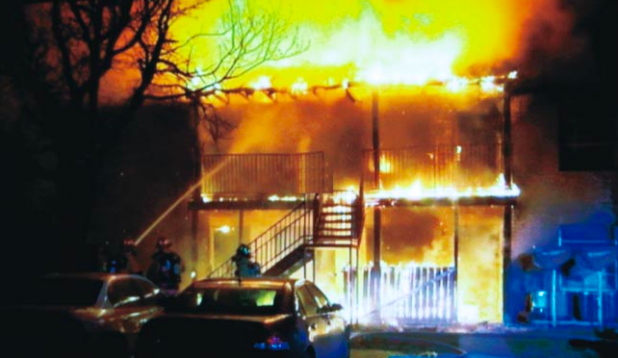 The fire was at the Sago Palms Apartments, and totally destroyed on of the buildings. 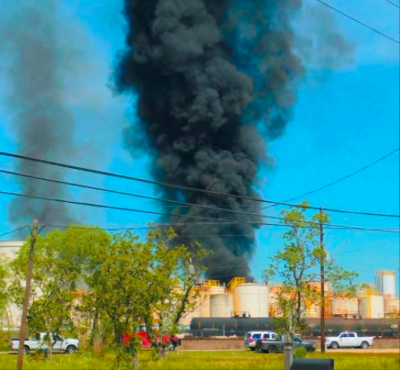 Houston Fire Department responded with two alarms, sending about 50 firefighters and two ladder trucks. There were 16 apartment units in the two story building, and about 30 persons lost their home and possessions. The Red Cross set up a shelter at a nearby church. One resident, Jacoby Ross, was treated for lacerations received from breaking out a window to self-evacuate. Due to the heat, he was unable to open his apartment door, so he escaped through a window. He then knocked on other apartments to alert sleeping residents. Another man jumped out a second floor window, with the help of neighbors. One woman lost her pet dog to the fire. No firefighters were injured. Both fires are currently under investigation, but the cause has not been determined.